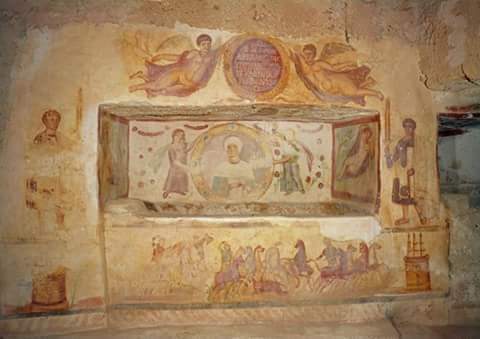 A few days ago a kind correspondent sent me details of the tomb of Aelia Arisuth, 8km west of Tripoli in Libya, which I have added to my digest of Mithras photographs. It’s listed in the CIMRM as CIMRM 113. 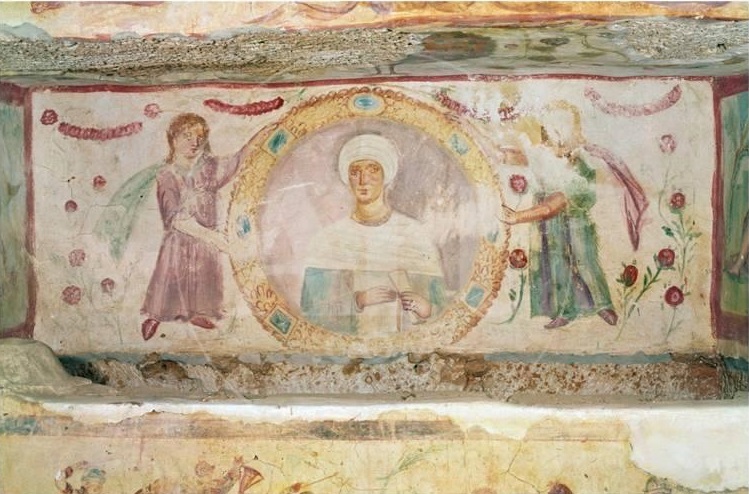 The tomb contains two tomb niches, one for Aelia Arisuth herself, and one for her husband, Aelius Magnus, son of Juratanus. 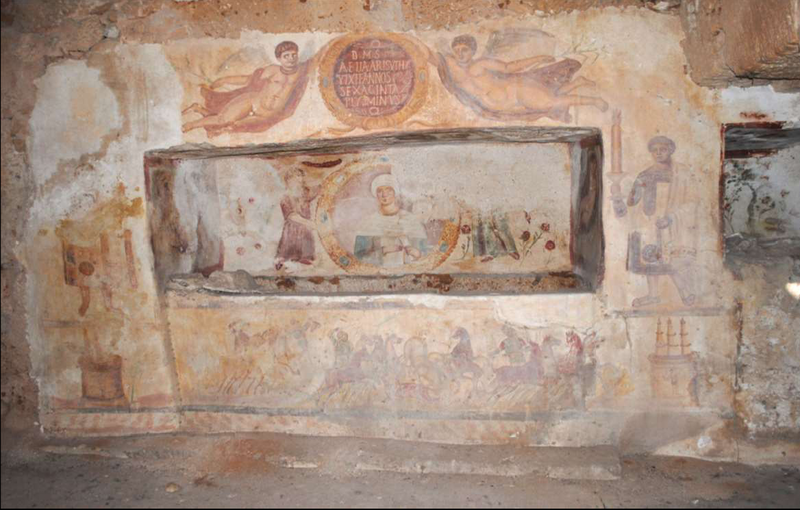 General results from Google attribute the tomb to the 4th century AD. The presence of two torch-bearers raised a question as to whether this was a Mithraic monument. The tomb of Aelius Magnus includes the inscription “qui leo iacet”, and his wife “quae lea iacet”, both referring to “lion”, a grade of Mithraic initiate. All the same there is nothing specifically Mithraic about this. There are few photographs online. I’ve not been there myself, although I visited Libya twice under the old regime as a tourist, so it was clearly not on the tourist trail, such as it was. The lower register depicts two spinae, the columns at the end of a race-track, and chariots in between. I was able to find a zoomed in picture of Aelia Arisuth herself, which must have been taken from life. Remarkable decoration, but, as you say, nothing specifically Mithraic about it, and indeed, “The connexion of this inscription with Mithraism is uncertain” (Aleš Chalupka, “Hyenas or Lionesses? Mithraism and Women in the Religious World of the Late Antiquity”, Religio xiii (2005), 198-230, p.200). So indeed is the existence of any grade of “lionesses” within Mithraism (Alison B. Griffith, “Completing the Picture: Women and the Female Principle in the Mithraic Cult”, Numen 53, No. 1 (2006), pp. 48-77). It is a pity that no one seems to have provided an illustration of the inscriptions, other than the one in the roundel above the niche. One always wants to see what it really says. Thank you for this extra info. I don’t think anyone much was allowed access to it; there seem to be no tourist photographs. I went to Libya twice on a tour in 2006 and 2008 and never heard of it. All that I could find as photographs were either professional things being sold as table mats; plus some amateur efforts from 2018 taken by a local, which show that someone tried to hack out one of the torchbearer heads. Presumably the guards have now vanished. I wish we had more images.